MediaFire review from BestBackups, looking at its security measures, customer service, features, usability and value for money. MediaFire doesn’t break any new ground, but basic features such as file sharing, uploads and downloads work well, and there are no major issues to drag it down. 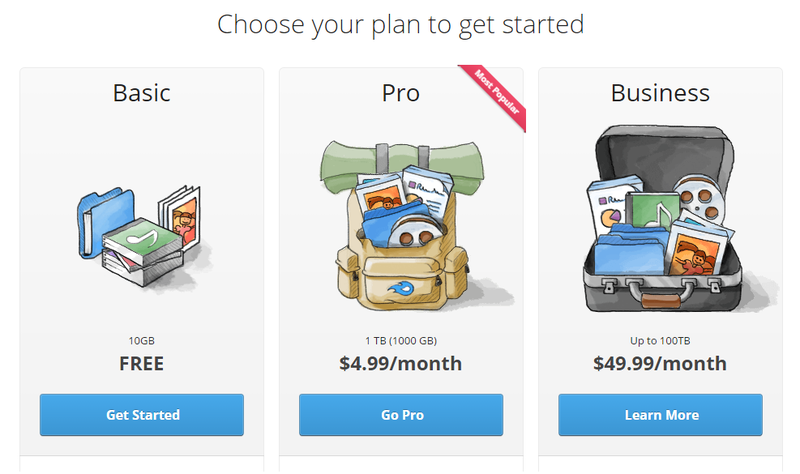 A reasonable price tag makes it worth a look if you want a simple but effective Cloud storage solution. You can read a detailed review below or sign up now. MediaFire offers two personal accounts – Basic and Pro. Basic users don’t have to pay a penny, and in return get access to 10GB of free space, which can be increased to 50GB by inviting friends and performing tasks such as installing the MediaFire mobile app and connecting to your Facebook account. While we’re not over-keen on swapping social media favors for storage space, it’s undeniable that this is a generous amount of space compared to the typical 2-10GB size of free accounts. There is a catch, however, as Basic subscribers will only have access to limited features, and all downloads are ad-supported – although this isn’t quite as disruptive as it sounds. There are options for Businesses too, with a 100TB plan that can be used up to 100 employees on offer for $49.99 per month. MediaFire’s Business plan also comes with extra customer support, a broader range of features and more control over settings and security. With limited storage space, manual rather than automatic backups and more focus on file sharing than long-term storage, MediaFire ticks all of the standard Cloud storage boxes. While the security-conscious and those looking to back up lots of data might be better off looking at online backup providers, Cloud storage is perfect if you want to share files with friends or colleagues, or if you need quick access to documents when you’re on the go. Based in Texas, MediaFire was co-founded in 2006 by Derek Labian and Tom Langridge, who have also collaborated on file hosting and gaming site FileFront (bought by Break Media in 2010) and mobile technology company IntoMobile. Today, MediaFire is an established contender in the backup market, bringing in over 150 million users per month as of 2015. There are three ways to upload files to MediaFire – from their website or desktop client, using the new MediaFire Windows app or directly from another web page. This unusual feature lets you save pictures from another page simply by selecting ‘upload from the web’ and entering the image URL. In all other respects, it functions like a standard upload, and you can access and download the image easily from your account once it’s been stored. Files uploaded from other sites can be anything from 10KB to 10GB in size, while those uploaded from your own PC can be up to 20GB if you’re using a 64-bit system, or 4GB on a 32-bit. While Pro subscribers shouldn’t encounter any problems transferring files to and from MediaFire, free users may be frustrated by the fact that files can only be downloaded one at a time. This makes it difficult and time-consuming to restore large numbers of files, although it shouldn’t pose too much of a problem for basic sync and share activities. MediaFire runs on Windows and Mac operating systems, as well as Android, and iOS for both iPad and iPhone. You can share files through MediaFire by creating public links which can be shared anywhere, or by inviting a selection of people to view or edit. There is also the option to create 1-Time Download links, which allow documents to be downloaded once, by a single user, and which can be edited to include restrictions such as expiry dates. Sharing files is very simple – you can either right-click on a document in your MediaFire desktop folder and choose ‘Share Through MediaFire’ or ‘Copy MediaFire Link’, or right-click on any file in your online account to see sharing options. On the downside, there is no longer a desktop sync option available – meaning that any changes you make to already backed up files on your hard drive will have to be applied to your MediaFire account manually. MediaFire offers file versioning, which allows you to access previous drafts of your files even after you’ve saved over them. You can choose to retain anything from five to 20 versions of each file, although the default setting is ten. Although this is less than some other providers offer, it should be enough for most people’s everyday use. In addition to this, files that you delete from your Cloud storage are moved to a kind of recycle bin, from where they can be easily restored. If you’ve got a Pro account, you can also use it for long-term storage, meaning that you can keep files in the Cloud that have been deleted from your hard drive. This effectively gives you an archive in which to store documents that you don’t need constant access to, as well as keeping backups of current files. MediaFire’s screenshot feature operates from the pop-up dashboard that’s created when you download their desktop client. 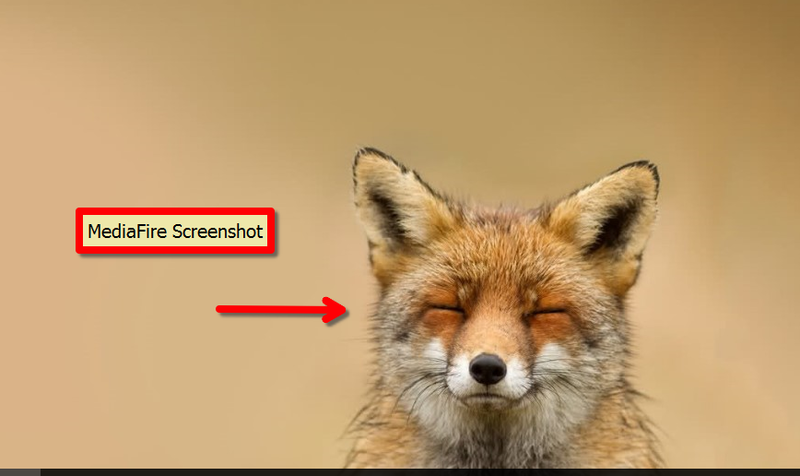 From here, you can take a screenshot of your screen, or part of it, which can be copied to the clipboard or uploaded directly to your MediaFire account. You can even add basic annotations such as text boxes and arrows. The idea of the screenshot feature is to make it easier to share your work in progress with colleagues or classmates. While there’s nothing wrong with the feature itself, we can’t help feeling that it doesn’t offer any exciting advantages over taking a screenshot the old fashioned way, except perhaps a net gain of a minute or two. MediaFire includes a media playback service, which allows you to stream audio and video files directly from your online account. Flash and HTML5 playback are both available, supporting mp3, ogg, oga, m4a and wav files between them. The media player itself is good quality, with a simple but attractive finish and an interface that makes it very easy to share and download files. Options include changing video quality, looping both video and audio files, and volume control, although there’s no playlist-style option to automatically play files one after the other. Buffering can be a little slow, but delays are minor and otherwise, everything works well. There’s a disconcerting lack of security information available on the MediaFire website, including in their Knowledgebase – the main source of customer support. “While all users [sic] sessions are encrypted, the files are not stored with any encryption. This is to facilitate linking and file sharing, as many users need our platform to allow connections to content they are trying to send out to others”. In essence, then, encryption is pretty thin on the ground at MediaFire. Their site does use an encrypted https connection, so your files are protected during transfer, but there are no additional measures in place to prevent anyone wanting to go through your files from doing so. Unsurprisingly, we’re not too impressed. Plenty of online backup and Cloud storage providers manage to combine file sharing with decent security, so we’re still lacking any really convincing explanation for the lack of privacy settings. If you’re particularly concerned about security, then, we would recommend encrypting your files using third party software before transferring them to MediaFire. MediaFire’s website is home to a large Knowledgebase, which covers a broad range of topics. While some information is a little out of date, there’s lots of advice available, both for getting started and troubleshooting. Unfortunately, there aren’t many ways to contact MediaFire support staff directly, with no live chat or phone service on offer. If you can’t find a solution to your problem anywhere on their site, you’ll have to send an email ticket. Although the ticketing system is available 24 hours a day, it took almost ten days for MediaFire to reply to our request and the response, when it came, was short and somewhat light on details. However, this may have been because we asked about security; a topic that they seem reluctant to open up about elsewhere on the site. MediaFire has a fairly extensive social media presence, with almost 150,000 followers on Twitter, and an impressive 8 million Facebook likes. Their profiles are updated a few times a month, and mostly contain company-related news, although they also have a good track record of getting back to customer enquiries. Their blog is very accessible, containing longer articles on new products and innovations. It’s easy to register with MediaFire, and downloading their desktop client just takes a click. You can choose to use Typical or Advanced settings during setup, with the Advanced option letting you select which files you want to backup. You won’t see any really advanced options here, but it’s useful for holders of accounts with limited storage space. Downloading MediaFire’s desktop client creates a sync folder on your desktop, the contents of which will be automatically synced to your account, appearing both in your online Cloud storage and also on any other connected devices. Adding files and folders is just a case of dragging and dropping, making it easy to get into the habit of keeping current files backed up. Downloading will also create a pop-up Dashboard that appears in the corner of your screen. From there, you can view any notifications associated with your account, take and upload screenshots, change your settings and quickly access your MediaFire sync folder if you’re in a hurry. You can also upload and download files from their website, with both methods simple, intuitive, and easy for even the least experienced user to navigate. While we had some serious reservations about the presence of adverts in MediaFire’s free subscription, they turned out to be surprisingly limited, with none of the annoying pop-ups or persistent interruptions we expected. You’ll see plenty of adverts when you download files, but they’re easy to avoid, and you can do everything else ad-free. That’s not to say that we like the system – no adverts at all would be much better – but on the whole, it’s a minor disruption that doesn’t cause too many problems. The other unexpected addition you’ll find is the presence of sample video, audio and image files. There’s nothing offensive about their content, and they can be deleted without difficulty, but it seems like something of an imposition on your account all the same. Featuring automatic camera uploads, customizable settings and the option to backup and retrieve files from your Cloud storage account, the MediaFire mobile app is fairly versatile, making it easy to manage your data from your phone. On the downside, we did find it a little slow at times, although this wasn’t a major problem. MediaFire isn’t the slickest or most advanced Cloud storage service on the market, but it still has something to offer. File transfers and sync and share options work as well as we could have hoped for and, although added extras like the inbuilt media player and screenshot feature aren’t exactly ground-breaking, they run smoothly and might come in useful once in a while. While ad-supported downloads and file transfer limitations may frustrate free users, and poor security is impossible to avoid regardless of which subscription you choose, you’ll still find some features worth signing up for. A low price tag should also help to seal the deal, making MediaFire an affordable and easy to use, if slightly unsophisticated, option. I was initially happy with Mediafire for the price. Recently they took away the desktop sync software, things really went downhill fast. The website is sluggish, uploading often crashes or creates duplicates, downloading is just so slow, if you have large files like myself, over 300mb.. they wont multi download.. its just unusable. The website crashes, constantly..Sadly paid for the year and only used half, but im off to amazon.. Yesterday I was a MediaFire Pro user (1TB space). But it’s a scam! 1. You can not select which subfolders to sync. 2. One day some of my files have been moved to trash! 3. Support doesn’t reply for tickets. 4. Very slow downloading, about 1.5MB/sec (I have 12.5 MB/sec connection according to speedtest). 5. Now I can not delete my files and can not even delete my account! I am a MediaFire Pro user (1TB space), and I\’m very happy with this service. Related with the fact that MediaFire is discontinuing their desktop application, I entered to the official blog and I saw that there is a new desktop app coming soon, so there is no problem for Windows/OS X users. The sync in all devices is awesome, I have both mobile apps (iOS/Android) with auto-upload fotos/videos enabled, and both work fantastically. also in Windows/OS X computers. Web is very easy to use and sharing options are very good. I only had to contact 1 time with support and I had no problem. The only thing I would add is a end-to-end encryption and other different security features. Is there a third-party cloud sync client that will work with MediaFire? That’d be really handy. Mediafire is discontinuing their desktop sync support. I have tens of thousands of files and 717GB backed up using my 1TB subscription. I now have no way of backing up changed files except manually which is ridiculous and unusable. MF must have few customers like me. I can’t see anyone with a large number of files or those using them for a true backup continuing to use them without the desktop sync. Thanks for your comment, and for bringing this to our attention – we’ll look into the changes taking place at MediaFire and make sure that our review is updated to reflect them. In the meantime, let us know if you’re thinking of changing your provider, and we’ll be happy to help! I have been using basic mediafire for years, and have found it very good. One thing I need from a file hoster, is not to have to keep visiting the site, or needing people to download files, so that they will stay online. mediafire is pretty good at that. But When I tried to upload large files, (around 1 gig) I found it incredibly slow. So I went back to basic. I have been really impressed with MediaFire’s interface after searching, researching and auditioning nearly a dozen cloud storage/sharing utilities over the past few days after learning early this week that Copy.com (remarkable service by Barracuda that I’ve used for the past few years and LOVED) is being discontinued and will shut down in May. For my purposes, direct linking and good interface with easy sharing and versioning sync’d between machines is paramount because it’s nearly all media (primarily photos and some videos and music). There isn’t really any privacy worry for me at least in terms of sensitive information so I’m happy to sacrifice a bit on that side for ease-of-use, particularly public sharing. There are MANY other tools that (believe me I’ve used them) make the opposite trade. I’m very happy thus far with Mediafire in this regard. What’s your opinion of MediaFire? Leave us a comment and let us know!